The C9orf72 "GGGGCC" repeat sequence codes five repeat peptide "GA repeat; GAGAGAGAGA", "GP repeat; GPGPGPGPG", "GR repeat; GRGRGRGRG", "AP repeat; APAPAPAPA" and "PR repeat; PRPRPRPRP". It was described previously that aggregated forms of poly-GA and poly-GP proteins do not enter the separation gel (PMID: 26374446). This antibody is used to detect the GR repeated sequence. 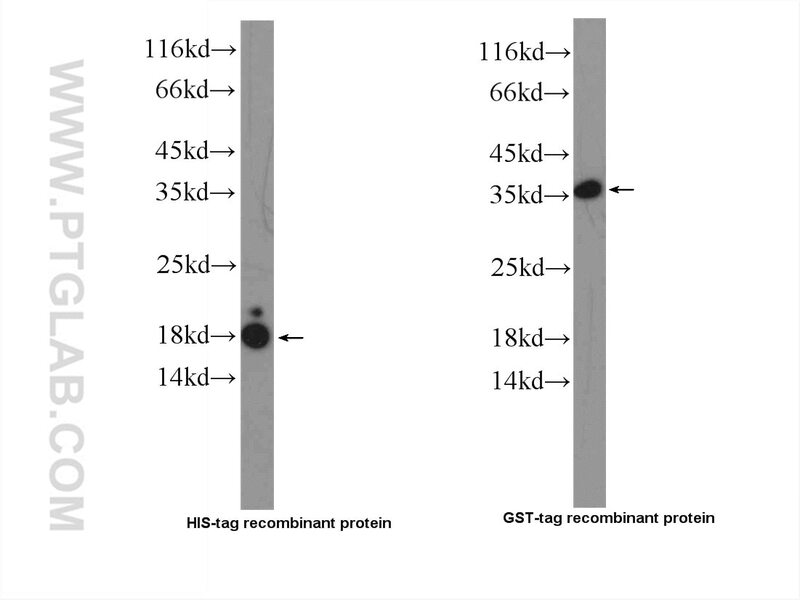 The recombinant proteins GST-SNRPD1 and 6*His tag- SNRPD1 which contains the sequence “GRGRGRGRGRGRGRGRGR” were used to detect this antibody. Both proteins can be recognized by the antibody 23978-1-AP. Stress Granule Assembly Disrupts Nucleocytoplasmic Transport. C9orf72 repeat expansions cause neurodegeneration in Drosophila through arginine-rich proteins. Antisense RNA foci in the motor neurons of C9ORF72-ALS patients are associated with TDP-43 proteinopathy. The C9orf72 repeat expansion disrupts nucleocytoplasmic transport. Quantitative analysis and clinico-pathological correlations of different dipeptide repeat protein pathologies in C9ORF72 mutation carriers. Neurodegeneration in Frontotemporal Lobar Degeneration and Motor Neurone Disease associated with expansions in C9orf72 is linked to TDP-43 pathology and not associated with aggregated forms of dipeptide repeat proteins.